Your Chillicothe & Worthington Invisalign Provider! 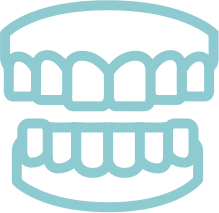 The invisible Orthodontic treatment known as “Invisalign” is prescribed to correct a number of common problems. Many people may need orthodontic treatment to correct an “unsatisfactory bite” that has been caused by crowding teeth or extra teeth. Other people may need treatment to realign a jaw that is out of place due to genetics or due to an accident. Many people want to correct one or more crooked teeth caused by thumb-sucking, premature or late loss of baby teeth, or a wide variety of other causes. No matter the reasoning, we can help get your bite back on the right track! At our Worthington and Chillicothe location, we now offer Invisalign to help you get the smile you always wanted without bands, brackets or wires! Whether your smile simply needs minor improvements or something more extreme, we can help you – without the metal. Invisalign uses comfortable plastic aligners to move teeth, so you can continue enjoying your active lifestyle even during treatment. And since Invisalign is removable, you can always take it out for a special event. Invisalign is practically invisible, but the results are not! What Are The Primary Causes of Misaligned Teeth? For more information regarding our Orthodontic treatment options, Invisalign service , contact Magnolia Dental today!